Well, Smalerie, and The Red Menace have done their reviews, and now it's my turn. 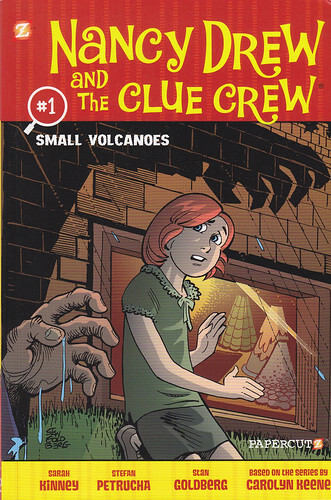 I read two Lego based graphic novels and one Nancy Drew and the Clue Crew book. Are these books something you or your kids might like? Take a read below and see! Volume 6- Warriors of Stone follows our heroes after having just lost their powers. No longer able to rely on elemental power, the little ninjas have to fall back on the other things they have learned when they come upon a land where everything is made of stone...even the people have become living stone. 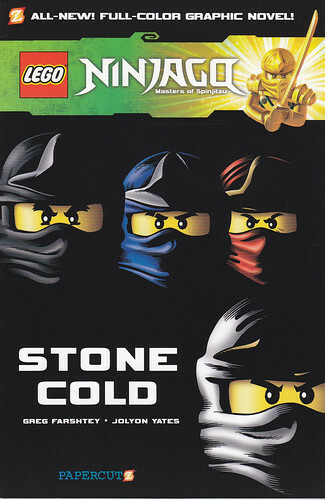 Volume 7- Stone Cold is a flash back issue that gives the story of Master Wu. 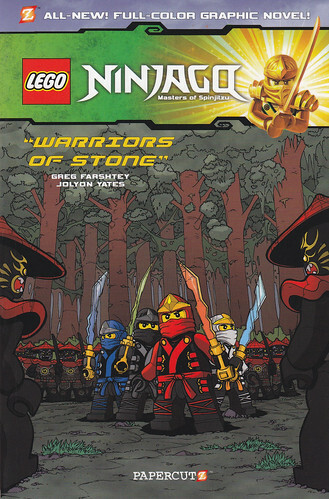 We learn that before assembling his team, Master Wu had to take on all the baddies of Ninjago on his own, after a super evil prison break. What I liked- Visually, these books are bold, colorful and easy to follow, which makes them a great introduction to reading comics. The stories have a lot of action, but also show the importance of teamwork and using your head. Each issue, while they can be read as stand alone, is part of a bigger story in an established world. This will hopefully encourage further reading in the series. The action and the monsters are fairly cartoony but could be a little scary for younger readers. You know your kid best, but my guess for ages is 9-12. What I wished- I think an even tinier Tiny Doom would have been into these books, but it would be nice if there were a girl ninja. An 8 year old Nancy and her friends Bess and George are the Clue Crew. As the name would imply, they solve mysteries. This first installment brings us a science mystery when the day before they are due, all the science projects Nancy's class made disappear! Nancy, Bess and George are they only students who hadn't finished their project yet. Can the Clue Crew solve the mystery while still finishing their own project? What I liked- The writers take the opportunity to teach a little earth science about the interior structure of the earth. Also, Nancy's family structure is non-traditional as she is being raised by her Dad and housekeeper Hannah-who Nancy says is a member of the family-since her mom died. Again, this book is colorful, and easy to follow. There is a little bit of action/excitement without it being too scary. Nancy is 8 in this story so I'll say this is best suited for kids 7-9. What I wished- I wished these were around when I was that age! I had to wait till I was a little older to get my parents to by me these...Nancy Drew Files Forever! FTC Full Disclosure: I received free copies of these books from Papercutz. I was not compensated with money or Lego or a papier-mâché volcano to write this review.